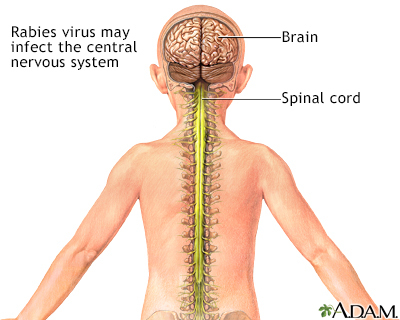 The central nervous system is made up of the brain and spinal cord. The brain functions to receive nerve impulses from the spinal cord and cranial nerves. The spinal cord contains the nerves that carry messages between the brain and the body. The rabies virus spreads through the nerves, first causing flu-like symptoms such as fever and malaise. As the disease advances to the brain, it causes anxiety, confusion, brain dysfunction, progressing to hallucinations, delirium, and insomnia. If left untreated, rabies is nearly always fatal.